There are several reasons for one to think of disabling the autoplay and/or auto-buffer feature from youtube videos. One of them is when multiple videos are opened in several tabs, the videos will all keep playing to themselves. Even when you decides to pause them individually, they will keep buffering or loading from the background thereby, wasting your internet data subscription. Preventing such from happening is what I am going to be sharing with you today. Just read on to find out the easiest tweak to stop the annoying YouTube videos auto-play. 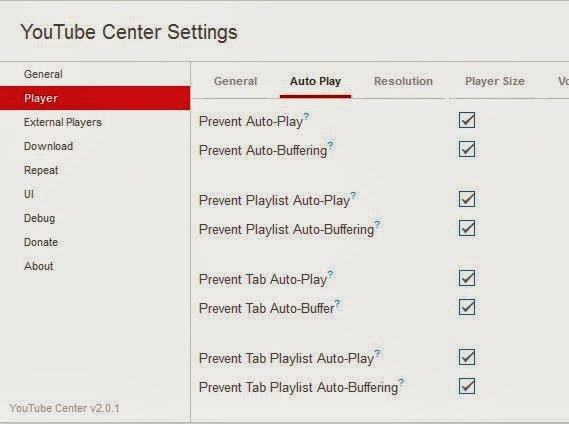 YouTube Center is the newest add-on that’s currently available on almost all popular web browsers around. With YouTube Center add-on active on your browser, you can gladly kiss good bye to those annoying features. YouTube Center makes your visit to YouTube so entertaining by giving you access to several hidden function to better customize it. You can control how your playlist works, how videos should play and all that. The add-on is compatible with the latest version of Mozilla Firefox, Google Chrome, Maxthon, Safari, Internet Explorer, Opera and several others. All you need do is follow the guidelines below to install and activate the add-on to any browser of your choice and have full control to how YouTube should work for you. Always visit the provided address with the browser you intend installing this add-on to, this is to make the installation much more easier. Google Chrome – Download and Install YouTube Center from here. Stop Autoplay for YouTube Extension works fine too but does allow the pre-buffering. Mozilla Firefox – Install and activate YouTube Center from the Mozilla Add-on repository link here. Opera – Can be downloaded from this link. Maxthon – Can be accessed and downloaded from this link. Other Browsers – If you are using Safari, Internet Explorer and other web browsers, simply follow this link for guidelines specific to your browser. Now that you have installed and activated the add-on or extension that’s applicable to your web browser. You need configure the plugin on your first visit to YouTube. This is to help you setup the options that works best for you using the provided functions. Can browse around YouTube site conveniently reading only comments or liking your best videos without having to watch the videos all over again.